This isn’t alphabet soup, but previous actions on our part certainly will have some payoff for this recipe. I’m talking about the vegetables used in it, and soon they will be from our own garden. 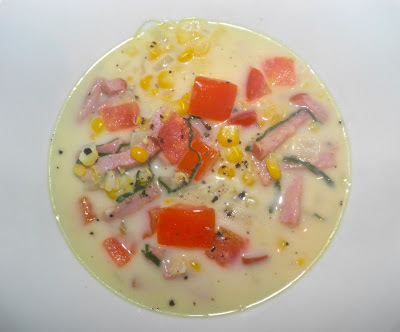 I made this before our harvest of corn, tomatoes and onions but it’s such a nice chowder I couldn’t wait. Truth be told, I had some tomatoes and fresh corn I previously purchased that needed to be used. Waste not, want not. you can use canned, but it's not as tasty. The day I made this it was a bit cool and overcast so turning on the stove in the kitchen wouldn’t make the house unbearably hot. I like the odd day like that. It’s a nice break from the summer heat. Before anyone brings it up, chowder usually contains fish, but doesn’t have to. The main characteristic is the use of cream. There are many variations. Creamy soup/chowder certainly hits the spot on days like those. At the same time, you want something that goes together quickly, like this one does. When our corn and tomatoes are in full swing I’m sure this dish will make an appearance again. We’ve been watching a fair number of BBC gardening shows via YouTube lately. They’re great sources of information for small scale gardening that we didn’t know, or have just discovered, over the past few months. The information certainly will be an influence next year when we plan and plant. From the amount of different programs it seems the British are significantly more interested in small gardens than we in North America. The sage seems to be quite happy alongside our basil. We’ve harvested quite a lot of fresh vegetables so far, and have even successively re-sowed some early greens, like lettuces and spinach. They are certainly impacting our bottom line. We’ll be in real trouble in a couple weeks when the tomatoes and cucumbers fully ripen. The only things we’ve had to buy are those items we can’t produce ourselves, like meat, cheese and dairy. 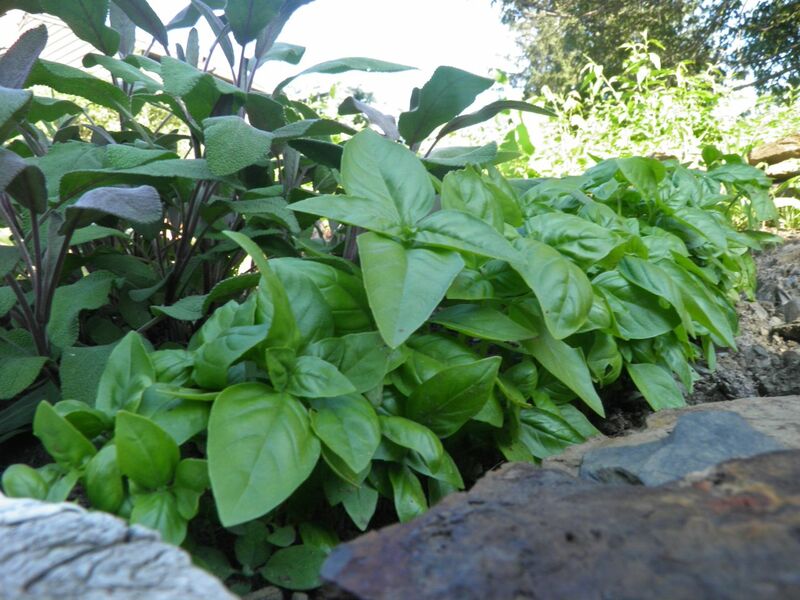 One major success we have had is our herbs: sage, basil, oregano, thyme, parsley and rosemary. They’ve grown by leaps and bounds. On BBC I learned they actually benefit from being constantly trimmed. It appears dried herbs will be off the shopping list through this winter. We currently have a significant amount of sage drying and what we harvested hardly made a dent in our single plant. It’s nice to have fresh herbs to cook with. They’re so much tastier than dried. They're also a star attraction in this dish. This soup is fast, and very fresh tasting. Corn cooks in minutes. Many people over-cook it. If you do it gets tough and looses some of its sweetness. The same is true of most other vegetables, too. If you find yourself in the mood for soup on a cool summer’s day, or a rainy one (like today is supposed to be), why not make soup? It’s a nice way to use some of nature’s bounty and remembering that the sun and warmth will come back tomorrow...or the day after. Heat the olive oil in a stock or soup pot. Sauté the onion, garlic and sage over medium heat in the oil until softened, about 3-4 minutes. Cut the ham into strips about 2” long. 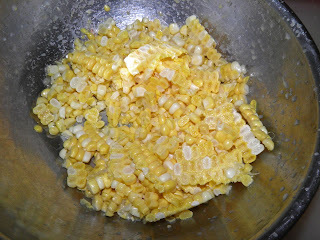 Add the corn, ham, stock, tomato, salt and pepper. 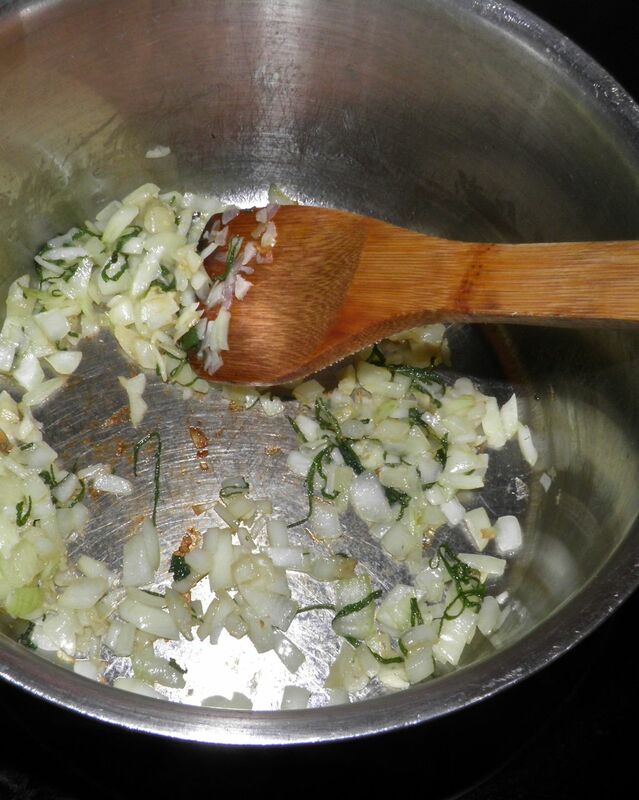 Bring the soup to a gentle boil and let cook for about 4 minutes. Stir in the gouda and cream and let heat through until the cheese is melted, a further 2 minutes. Taste for salt and pepper and then serve with more grated cheese on top, if desired.